We all know that finding fresh vegetables, fruits and other organic items in Dubai used to be a nightmare. You used to trawl all through your nearby local supermarket; digging away at half mouldy organs and partially rotten cabbages; just to find a few that are edible. But if you are travelling to Dubai these days and if you are an organic shopper; then you just don’t need to be worried at all. Because today, Dubai has turned into a full-fledged arena of organic stores, shops and restaurant; though all you need is to be picky! Talking about the organic shopping world of Dubai; here are my 5 favorite organic shops in Dubai that really offer you fresh vegetable, fruits and much more. Trace yours quickly! Bio Organic Store offer one of the widest ranges of approximately 2,000 organic products under one roof, including fruits & vegetable, creamery, butchery, bakery, grocery and kids’ food items. Bio Organic’s pantry is vast and versatile. This organic shop also offers online shopping and home delivery and allows you to choose from an absolute massive organic product range. Here you can genuinely find everything from meal to your newly teething baby to fresh prepared coconut ice-cream to farm fresh oranges, apples, milk to sausages of organic lamb and beef. Bio Organic store is located in Hessa Street-Tecom that opens every day between 08.00 am – 09.00pm. Bio Organic deliver 7 days a week. I highly recommend Bio Organic for your weekly food shopping. All you will do is to dial +971-56-6541956 right away whenever you feel going organic. Greenheart is an absolute gem heart for organic foodies in Dubai. They are deeply indulged in growing and processing organic products and also often invite their customer to visit their farms and orchids. Greenheart Organic Farm offers a wide range of fruits, vegetable, eggs, milk, honey, and other grocery items. At Greenheart you can also find delicious combos that suits exactly to your needs at the most affordable prices. Greenheart can also deliver at your doorstep every day except between 9am to 5 pm. Down to Earth Organic serves you with an assortment of organic food, cosmetics and textiles to choose from. It offers you a great range of environmental friendly, chemical free and healthy products that suits just the best for your organic lifestyle. Although Down to Earth Organic is new in town; it sufficiently provides the quality supply of food items that they buy directly from the farmers who only prefer growing and processing organically. The Down to Earth Organic is located at the Sheikh Hamdan Complex, Jumeirah. You can also order online or via call just by dialing 800-ORGANIC from your phone. Organic Food & Café offers a wide range of bio-dynamic farming food item, organic chicken, meat, eggs, milk, dairy products, vegan, gluten free food items, beauty and body care products, fish and seafood, super food, organic diet items, beverages and baby food products. 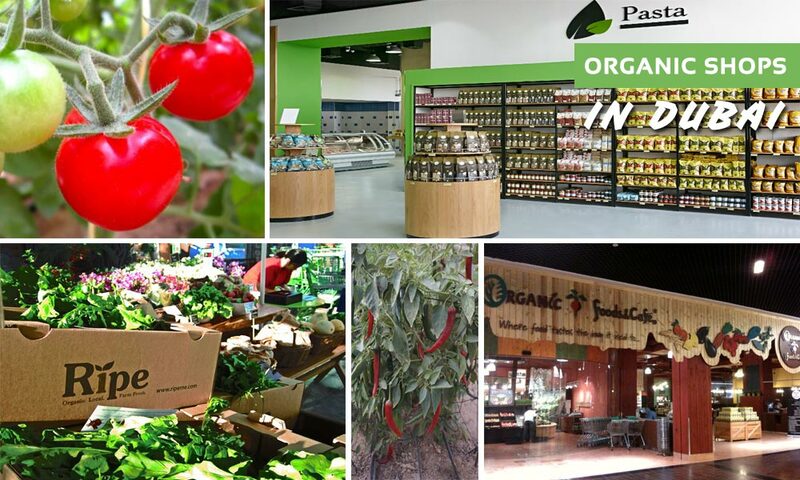 Located at various locations, however the shop on Sheikh Zayed Road is one of the biggest organic shops in Dubai. You can shop from Organic Food & Café daily between 9am to 8pm. These are some of the recommended food stores & organic shops in Dubai. There are also online grocery shopping in Dubai stores that offer range of organic products. If you would like to recommend an organic shop in Dubai, please do so by adding comments below. Organic Foods and Café is a family run organic supermarket and café that sells fresh organic and biodynamic food, supplements, skincare, cosmetics, baby items and household cleaning products. It opened its first store at Satwa, Dubai UAE in 2005 and its 2nd outlet in the Greens in 2006. In 2008, the supermarket and café in Satwa was replaced with a new store three times the size in Dubai Mall, the world’s largest shopping mall, followed by the opening of the supermarket in Masdar city, Abu Dhabi and the supermarket and Café in Seef Mall, Bahrain. In the beginning of 2013, we closed our outlet in Dubai Mall and opened a new flagship store on Sheikh Zayed Road, next to Oasis Center. Our shop in The Village in Jumeirah 1 opened in October 2013 followed by our shop in Abu Dhabi in Nation Towers Galleria opened in November 2014. With soon to open a franchise in Business Bay Avenue in June 2016 and another shop in Mirdif by end of 2016. Organic Foods and Café is currently expanding with several new stores opening in various locations throughout the UAE and the GCC. It supplies over 6,000 hormone and chemical free products direct from family run farms throughout the world as well as the largest gluten free products in the region and caters to the health conscious and eco conscious consumer.